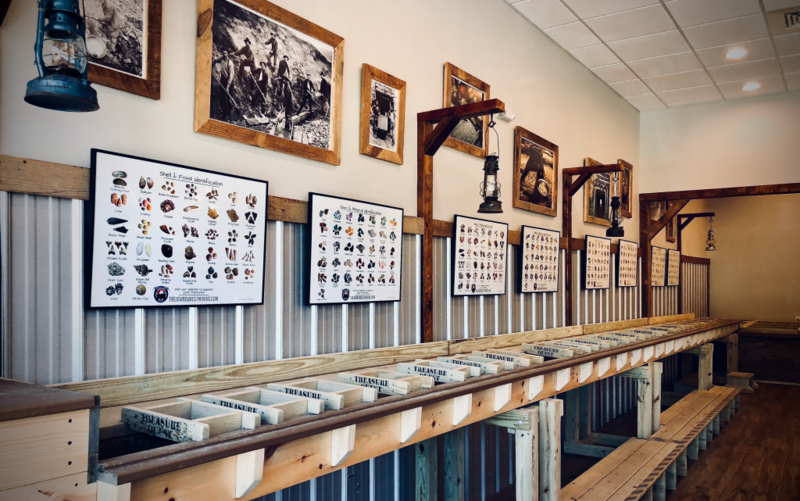 Visit our store located near downtown Apex to experience indoor gem mining and gold panning. No appointment or reservation is needed and you do not have to be a part of a group to experience gem mining. Simply drop by our store during our open hours, purchase a bucket of mining rough and have a great time! 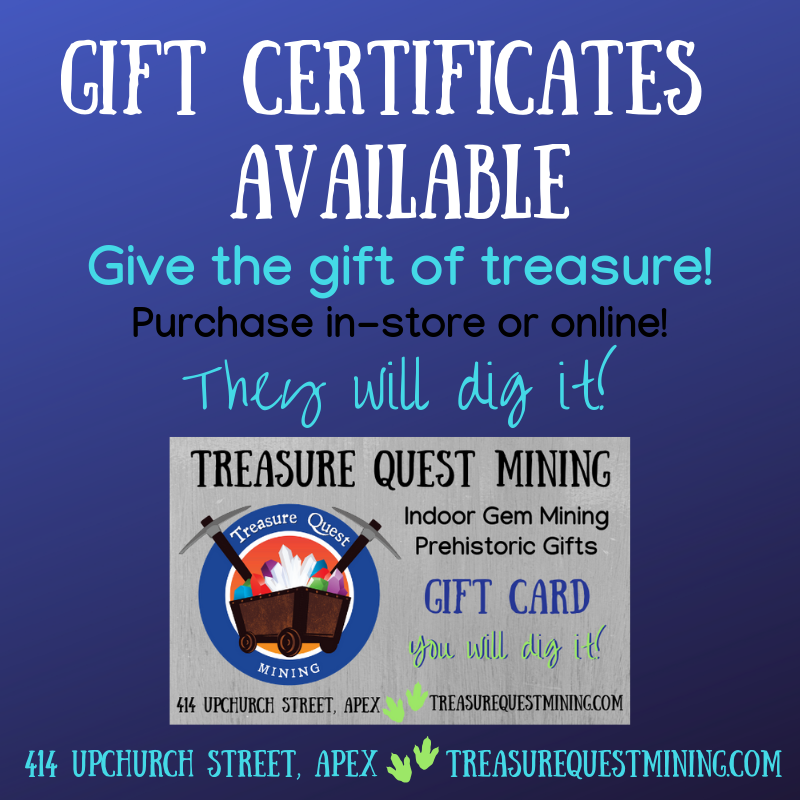 Or give the gift of treasure with gift certificates, available for purchase online or in our store. And one other important note – we charge by the bucket, not by the person. You are welcome to share a bucket among miners! 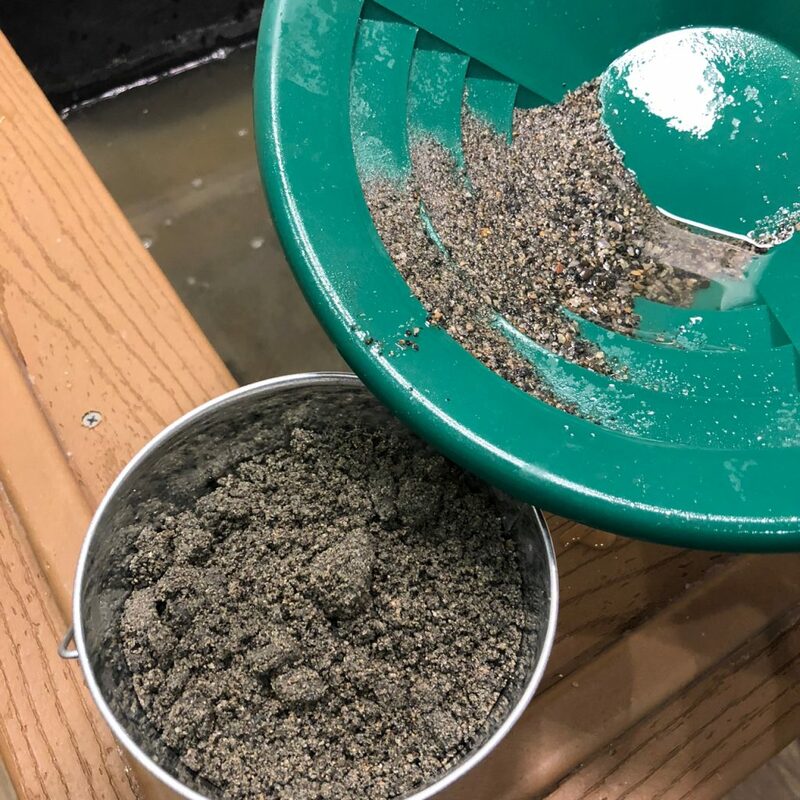 Simply purchase a bucket of mining rough and wash the material in our 35-foot-long indoor sluice. The running water rinses away the sediment, revealing the treasures contained within the material. Treasure hunters keep their finds, starting or adding to their collection. We offer several size buckets and mining rough mixes to choose from. We hand-assemble each bucket utilizing gems and minerals from around the world. We buy our rocks by the ton, literally. Because of our incredible buying power and commitment to excellence, we are able to offer you the highest quality bucket at the greatest value! Our prices and value simply cannot be beaten! contains a half-pound (8 ounces) of gems and minerals from around the world in a rainbow of colors. You may find well-known semi-precious stones or unfamiliar, unique gems and minerals. Visit our Gem & Mineral identification pageto explore a sampling of what you may discover. A similarly sized portion is available at other area mines for $18 to $25 – why pay more anywhere else? contains 5 times the amount of gems and minerals than you will find in our Rockhound bucket, including some highly-prized finds! A win for the rockhound at heart! This is a great bucket for the enthusiast or is large enough to split among a small group. You will not find this amount of treasure, especially at this price, at any other gem mine in the region! the motherlode of gem mining buckets! This 5-gallon behemoth holds 10 times the treasure you will find in our Rockhound bucket, including precious gems like rubies, sapphires, emeralds, and aquamarine. This bucket is a true Treasure Quest! The quality and value of our Treasure Quest bucket cannot be beaten! You will be amazed and overjoyed with your findings! contains a hearty handful of our seashells from the Indian and Pacific Oceans, fossilized sharks’ teeth, and other beach finds. You’ll find shells that are uniquely different than those found on US shores; a great way to add variety to your collection. a super-sized Beachcomber complete with an authentic Megalodon tooth and other fossils. Sure to please the shark enthusiast! You can view our Treasure Identificationpages to learn more about your treasures. Pan for real gold! Purchase a bucket of concentrate and pan for real gold using our panning station. With each purchase, you will receive a glass vial to store your gold flakes. As with our mining rough buckets, each bucket of gold concentrate is hand-assembled ensuring that there is gold in each bucket! using our in-store geode-cracker (we’ve affectionately named “the Kraken”), crack open your own crystal geodes. We’ll get it set-up for you and you’ll crack it open! Or take them with you and crack at home. We assemble each bag of mining rough by hand, ensuring that each treasure hunter finds a well-balanced, high-quality mixture of treasures. While this takes a great deal of time, as parents, we want everyone to have a joy-filled experience. We are certain you and your family will truly enjoy your Treasure Quest! Mine with us. You will dig it! We invite you to join in on the fun! Visit our store to enjoy an indoor, climate-controlled gem mining experience. Open 7-days a week, year-round, we offer you the opportunity to mine rain or shine! We also operate a mobile sluice, you can also find us at fairs, festivals and other events in North Carolina. Contact us to schedule the sluice at your next festival, event, or school field trip.